We've managed to avoid this place for nearly a year but finally a review needed to be done. We arrived at around 8:30pm on a Wednesday to find it empty although to be fair this place doesn't open normal pub hours so it may have just opened. 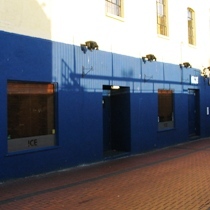 It is primarily a pre-Adelaide drinking place with the nightclub upstairs so it mainly attracts the young crowd. As expected there was no real ale. Those of us who asked for lager had to wait for the liquid coming out of the taps to turn from water to lager. I took the safe option and had a bottle of Corona but it did not come with a slice of lime and I doubt whether they had any limes on the premises so I didn't bother asking. The walls were rather bare and painted yellow and blue - I suppose they are the colours of St Albans FC. There's a plasma screen on the wall showing music from one of the music channels. On the left as you enter there's a raised area where the karaoke was being setup. This was one of our quickest pub visits and we were in and out in about 15 minutes. Apparantly this place does get busy with youngsters at the weekends in the late part of the evening but if you appreciate a pub with good beer, good atmosphere and some character avoid this place! The Ice bar is closed. Open as Bar Veeda at weekends as part of the new Club Veeda Nightclub.